A) Weight of overlying fill, including any local surcharge. B) Soil pressures transmitted to the pipe from surface loads, i.e. traffic and other transient loads. C) Supporting reaction below the pipe. The established method for calculation of loads on buried rigid pipes is summarised in BS EN 1295 National Annex A, the principles of which are explained in The Complete Technical Design Guide. In general, pipelines are laid in trenches and the pipes are designed to carry the backfill, traffic loads and when the diameter is 600mm or more, part of the water load within the pipe. To improve the load carrying capacity of the pipe, it may be installed using an appropriate bedding class chosen from a number of alternatives. Each type of bedding is allocated a “bedding factor” (Fm) which may be regarded as a multiplier applied to the test load of the pipe. 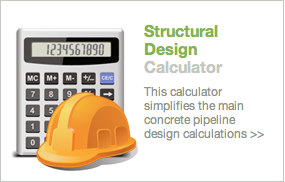 To make the pipeline designer’s life easier, this calculator simplifies the main structural calculations. It offers all the basic values from design loads (We), to bedding factors (Fm) and required BS Test Pipe Strengths (Fn) and then recommends a bedding class. Once you have established a suitable bedding design, you can then use the Material Cost Calculator to estimate material costs.